Be sure to check out the February 2019 issue of techniques magazine. 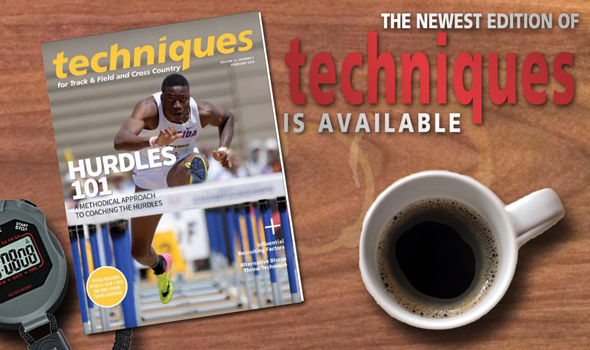 The featured article in this edition is entitled, "Sprint Hurdling: Breaking Down The Most Successful Techniques." It was penned by Mike Thorson, who is an assistant coach at the University of Mary in charge of the hurdlers. Thorson was the former Director of Track & Field and Cross Country at the same institution. Other articles this quarter include "Influential Recruiting Factors: For Collegiate Individual Sport Athletes" by Bill Ferguson and Michelle Moosbrugger, "Biomechanical Measures: Prevent Over-Training Syndrome in Collegiate Distance Runners" by David Granato, "Alternative Discus Throw Techniques" by Tatiana Zhuravleva and biomechanical review by Jesus Dapena and finally "Don’t Forget The Field Events" by Mary Helen Sprecher.